I made some Spicy Tomato Sauce with Poached eggs last week. Twice, actually. That’s not unusual for me. When the weather outside is cold and I barely have enough time to eat, this is one of my go-to dishes. It’s one of those dishes that is so comforting, yet simple and quick. We either have it over brown rice or pasta. It’s delicious either way. Of course, I had to add a little bit of Korean love to this dish. I absolutely love gochujang (Korean chili pepper paste) in tomato sauce. It tempers the acidity of the tomato sauce just perfectly, while imparting some sweetness and spiciness to the sauce. If you don’t have access to gochujang, of course, you can add tomato paste. I add both if I have both in my fridge. Just make sure they add up to about 2-3 teaspoons. The resulting sauce is SO GOOD. You have to give it a try. Heat a pan over medium heat. Once the pan is hot, add about a tablespoon of oil to the pan. 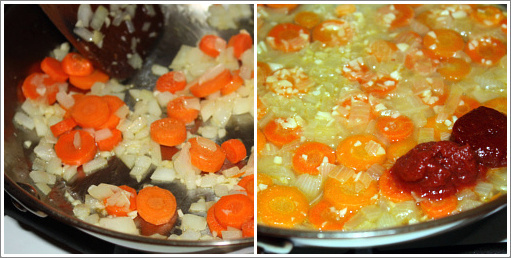 Add garlic, onion, and carrot to the pan. Sauté until the onion is translucent. Add a pinch of salt and stir. Add broth to the pan and allow the contents to come to a boil. Cover and simmer for about 5 minutes to allow the carrots to soften. Adjust the heat accordingly. There should still be some broth left over in the pan after 5 minutes. Add gochujang and/or tomato paste to the pan. Stir. Add a pinch of salt, chopped tomatoes, and agave nectar (or brown sugar) to the pan. Stir and allow the contents to come to a light boil. Cover and allow the contents to boil for about 5 minutes. Add beans (and chicken, if using) to the pan. Stir. Once the contents start to boil, crack two eggs into the pan carefully to ensure that the yolks are intact. Add some salt and pepper to the eggs. Lower the heat. Cover the pan tightly and allow the eggs to poach in the sauce, for about 3-5 minutes. Once the eggs are poached, remove the poached eggs onto two bowls/plates of rice or pasta. Add frozen peas and parsley to the pan and stir. Just allow the peas to warm in the sauce. Salt to taste. Remove from heat immediately and divide among two bowls/plates. Garnish with some chopped parsley if desired and serve. 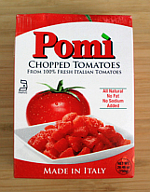 I use POMI chopped tomatoes. It’s in a SIG carton packaging, which means no BPA like the canned tomatoes. I use 1/2 of the package and refrigerate the other half in an airtight container. Additionally, no salt is added to the tomatoes. So you can adjust the saltiness to your liking. If you do not have gochujang (Korean red chili pepper paste), you can just use tomato paste. But make sure to add some chili pepper flakes for spiciness. If you have both, add both! You can add more broth if you want to thin out the sauce. On the flip side, if you want to thicken up the sauce, turn up the heat at the end and allow the liquid to evaporate (or you can just add a little more gochujang/tomato paste). Thrown in some (1/4 – 1/3 cup) baked chicken, if you have any on hand. It tastes like a Korean/Italian version of oyakodon (Japanese chicken and egg bowl), which is one of my favorite comfort foods. Of course, it won’t be vegetarian if chicken and/or chicken broth is used. Thank you Grace! I know how your mom feels, I go through periods where I have to add gochujang to everything. 🙂 I hope your mom enjoys the dish. Thank you for coming by the site! Happy to know I am not the only one that goes through periods of adding gochujang to everything! That stuff is addicting! I love this recipe and will be duplicating in the next day or so. Thanks! Very addicting! You’re definitely not the only one. I got my husband addicted to it as well. Now he can’t eat his greens without gochujang. Let me know how it turns out. 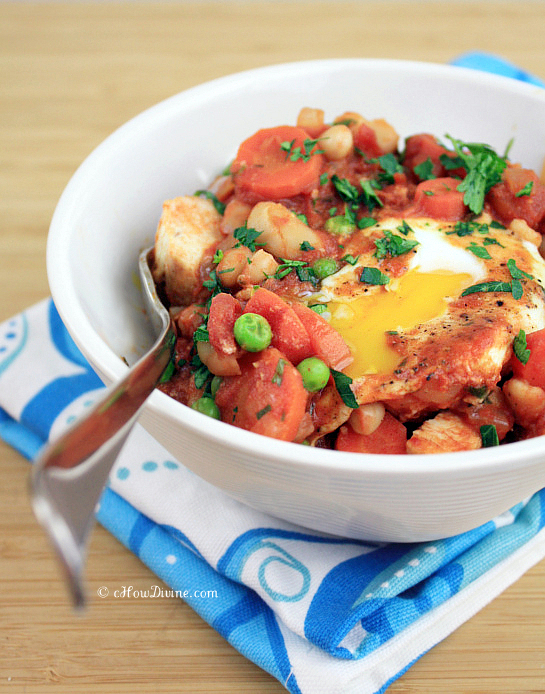 Love that this is healthy and savory, yet quick and easy enough to whip up after a long work day! 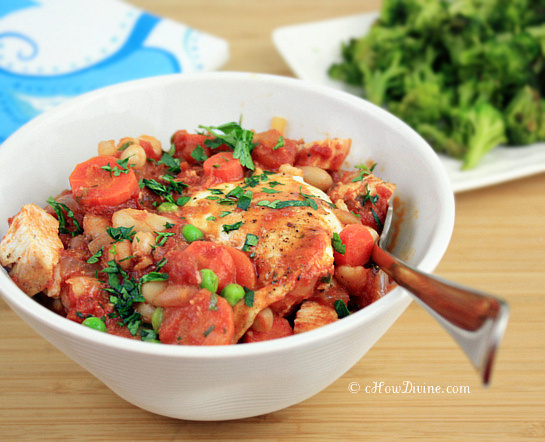 Love the idea of putting it over brown rice…yum! Thanks for dropping by Jess! It’s one of our weeknight regulars, super easy and quick to make. I hope you try it out! Haha…we are on the same gochujang kick! I absolutely love your dish-it’s simple yet delicious, in another word perfect for weeknight meal! Fantastic recipe and yummy pics! Thanks Sandra! You know, many Koreans pack a jar of gochujang when they go on trips. When I moved here from Cali, my grandmother packed me a huge jar of homemade gochujang. I thought it ridiculous at first, but it ended up saving many meals for us. Love the stuff. 😀 Have a lovely weekend with your family! I definitely need to find a source of gochujang – its flavor is wonderful. I’ve eaten it before, of course, but don’t cook with it – that needs to change. Anyway, lovely dish – tomato sauces go so well with poached eggs. Good stuff – thanks. Thanks John! You definitely have to get yourself some gochujang 🙂 It wouldn’t be an exaggeration to say I’m addicted to it. I can make just about anything a meal with it. Thanks coming by the site and for your comment!